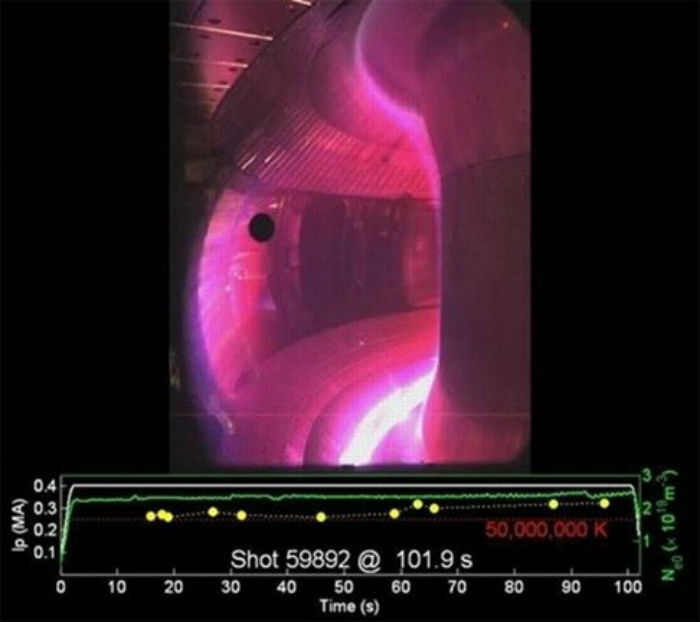 Just last week, we reported that Germany’s revolutionary nuclear fusion machine managed to heat hydrogen gas to 80 million degrees Celsius, and sustain a cloud of hydrogen plasma for a quarter of a second. This was a huge milestone in the decades-long pursuit of controlled nuclear fusion, because if we can produce and hold onto hydrogen plasma for a certain period, we can harness the clean, practically limitless energy that fuels our Sun. Now physicists in China have announced that their own nuclear fusion machine, called the Experimental Advanced Superconducting Tokamak (EAST), has produced hydrogen plasma at 49.999 million degrees Celsius, and held onto it for an impressive 102 seconds. While this is nowhere near the hottest temperature that’s been produced by an experiment - that honour goes to the Large Hadron Collider, which hit a whopping 4 trillion degrees Celsius (250,000 times hotter than the centre of the Sun) back in 2012 - the team from China’s Institute of Physical Science in Hefei managed to recreate solar conditions for well over a minute. Sustaining these incredibly high temperatures for long enough to harness the energy produced by the reaction is key to achieving controlled nuclear fusion, as it allows for more stable alignment of the magnetic fields that are used to manoeuvre the plasma away from the walls of the machine, and the collection of high-energy particles and heat energy that are produced as part of the reaction. Nuclear fission, which is what our current nuclear facilities achieve, generates energy by splitting the nucleus of an atom into smaller neutrons and nuclei. While fission is super efficient - the amount of energy it releases is millions of times more efficient per mass than that of coal - management of dangerous radioactive byproducts is incredibly expensive. That’s what makes nuclear fusion so desirable: it involves producing huge amounts of energy when atoms are fused together at incredibly high temperatures, but produces no radioactive waste or other unwanted byproducts. The problem is it requires far higher temperatures. While nuclear fission requires things to be heated to just a few hundred degrees Celsius, nuclear fusion machines have to recreate conditions on the Sun, which means we’re talking several million degrees. In fact, because our machines are essentially starting their reactions from scratch, we actually need to achieve temperatures far hotter than those estimated to exist in the centre of the Sun - the team behind Germany’s US$1 billion stellarator nuclear fusion machine says the ideal temperature is 100 million degrees Celsius. This is what China’s team was hoping to hit last week, but had to settle for close to 50 million degrees, Stephen Chen from the South China Morning Post reports. Their ultimate goal is to hit 100 million degrees Celsius, and sustain the resulting hydrogen plasma for over 1,000 seconds, or 17 minutes. Meanwhile, the German team says it could conceivably sustain its plasma for as long as 30 minutes, now that their 'proof of concept' experiment is out of the way. Now, we must make it clear that the results coming out of China are based on a statement by the Hefei Institute of Physical Science, and until we see a peer-reviewed paper detailing how they achieved these temperatures and times, we have to remain skeptical. But if everything checks out, we really do have a bonafide "Battle of the doughnut-shaped nuclear fusion machines" on our hands, with the Germans needing to work on their time, and the Chinese needing to work on their temperatures. We're still likely decades away from actually harnessing nuclear fusion to solve humanity's energy problems (if - and that's a big "if" - we figure out how to do it at all), but scientists are making some amazing progress. And we love a bit of healthy competition.